Your Children and Their Development. From the moment your child is born they begin to learn and develop. Were you aware that the amount a child learns within the first five years of their life is more than they will learn in any other time of their life? These are the years that your child is being shaped for their future. A combination of good health, excellent nutrition and an environment that is stimulating to your child will develop the brain of your child in a positive manner while also providing a good influence on their physical, social, emotional and language skills. The opposite must also be taken into consideration. Bad experiences including neglect and abuse may have negative ramifications on the development of the brain combined with emotional and behavioral concerns later in life. Children should not be judged against other children as every child will develop at their own pace. Some parents get excited if their child is walking before another, or swimming before someone else’s child. As parents and caregivers, it is important to remember there is no competition; it is about supporting a child’s development in a positive fashion and guiding them in the right direction. Are you aware that by the time a baby is four months old they have already established a personality of their own? They are also familiar and recognize their name and may also be pacified by the sound of your voice. Placing a small safe toy just lightly out of reach and encourage them to crawl toward it. This will help with motor skill development. Using your hands and waving them around or clapping is a great way to mimic the way they behave. Showing baby their own reflection in a mirror can go a long way. Although they may just stare with a blank look on their face, this goes a long way to encourage learning. Another fun activity? Peek-a-boo. What baby doesn’t like peek-a-boo? Encouraging your young one to wiggle around on the floor and stretch also helps with learning and helps with blood flow. Although they may not appear to take in books, reading to them from a very young age has proven to be beneficial in long term studies. Engagement from a very young age is extremely important and should not be underestimated. All those sounds you hear your baby making, whether they are squeaks, squeals or cooing sounds are signs of development and learning. 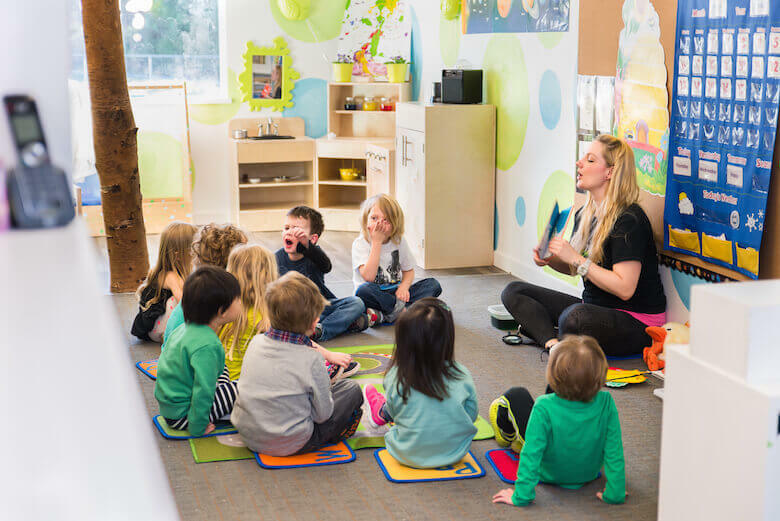 As a daycare in the Langley area, we genuinely care about the kids we look after and try to help parents and arm them with the best information possible. This being said, we always encourage parents to do their own research and never take any information for granted.